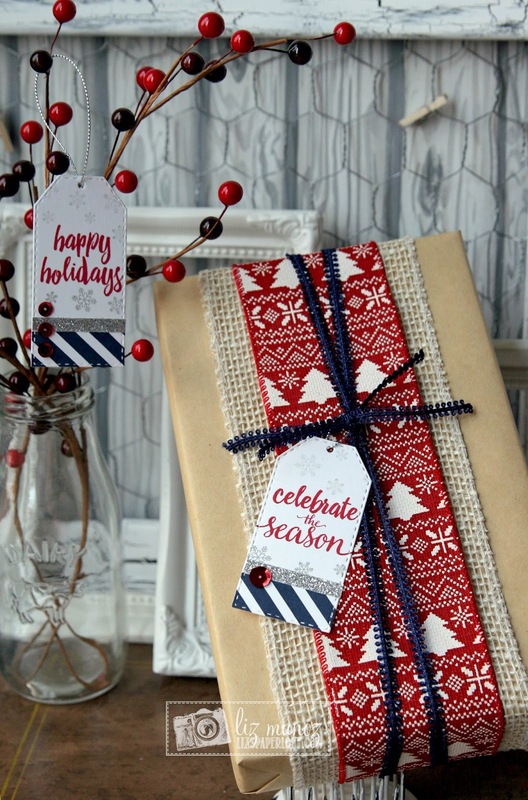 Liz's Paper Loft: MCT September Release Sneak Peek Day 2 ~ happy holidays! 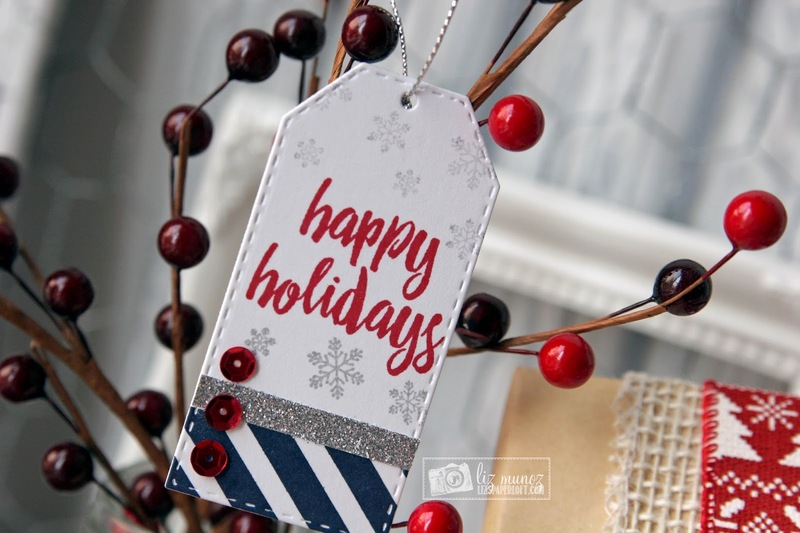 MCT September Release Sneak Peek Day 2 ~ happy holidays! Welcome to My Creative Time September Release Day 2 Sneak Peeks! This is a HUGE set! Seriously HUGE! The four tags that I made to share with you only scratches the surface...I bet you think I'm exaggerating, but I'm not! The first thing I did was stamp the navy stripe, next stamped the sentiment, then did the snowflakes. It was quick and easy...my kind of crafting! Very pretty! Great color palette too! I love how elegant the is set is! What a fabulous ensemble! Love your tags and gift packaging! So pretty and the colors are fantastic! TFS! Thanks for sharing your cute tags. I loVe how you did the Santa with the circle. Love both of your tags! Beautiful! Your tags are perfect for your pretty packages. Love the different shapes of tags. OMG Miss Liz you certainly came up with lots of fun...Fab...and tote tote adorabs ideas OMG love how you still with the set came up with your signature Vintage/shabby/chic designs....girl you so made my day!! I sooo can't wait to get it all!! YOU do ROCK!! Liz, you've captured my heart with your amazing tag stamp/die combinations! Classy and sophisticated! Forget crushing over and being smitten by: I've fallen head over heels in LOVE! In awe...Your showcase has sealed the deal: I *need* these! 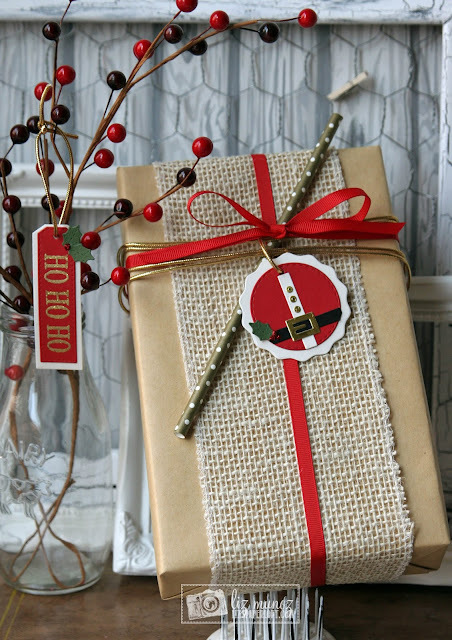 Love the ribbons over the burlap. Wrapping presents is not a skill I've been able to master. Your packages are beautiful. The gift tags are darling. I make my own tags so I'll be using these ideas. Such pretty tags! I can't wait to play with this set! What stunning tags! I especially love the color scheme on the first two. Beautiful! Your tags are fabulous! Your creativity always makes me want to try harder! Thanks for sharing. Love those tags and the colors are so beautiful! This set is really amazing. Great use of the new set and what a beautiful package. Liz! These are by far my favorite! At first I thought you had laid down washi for the blue stripe at the bottom of the tags, but then I read it was made using the Geo Borders! That made me so excited! I just ordered that set! Thank you for inspiring me! These are perfect for this holiday! Pretty tags! They look simply made but very pretty for the holidays. I like how you showed that the Santa suit could be versatile on a circle. Sometimes it's right under your nose and you don't think of it, so you just showed how you can move it really all around. Thanks to Miss Emma, you, and all the DT team! Lol The dies will make Christmas a little less stressy if you are hurting for time. Big help!!! Wow, look at your presents, they look stunning! The tags are just beautiful and I have to say the navy looks so awesome in your first photo! Great job Liz and thank you for some amazing inspiration! Wow I love those tags, great dies, your creations are beautiful! Wow, what PRETTY packaging and tags. Perfect designs. I'm just loving all these Santa tags! So cute! I can't wait to see everything! Tag making is going to be so much fun this year!!! :) Great job Liz! As always - AWESOME! I have to say I'm partial to the round one with the Santa belt! CUTE! These tags look fabulous on the gifts. Oh wow! I absolutely love all of these tags! You do amazing work! Love this new sneak peak and the way you showcased it. Fabulous display! I love your round Santa suit tag! Wonderful tags! I really need this new set! I must say your gifts are wrapped so pretty. The tags are made beautifully and add to the decorations already on the gifts. Fabulous job! This set sure is a must have. What beautiful tags. Can not wait to see more wonderful projects. 4 awesome tags. i love the way you wrapped the presents too. This years design team totally rocks. Mr hank you for the inspiration. These tags are so fun and festive! Okay, first of all, can you wrap my presents this year? Seriously, that package is amazing! Your tags are gorgeous! 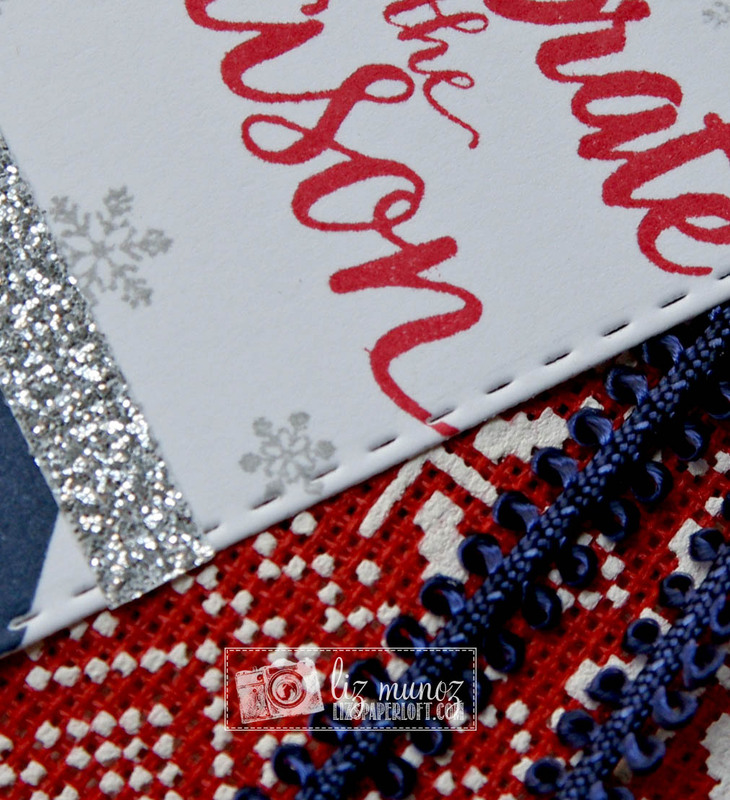 LOVE the navy stripes and snowflake combo! AWESOME job with your sneaks Liz!!!! Your tags look amazing on the packages!!!! EEK!!! Liz I can't wait to get these for Christmas ~ I am claiming these for sure! CLEVER to use the Santa dies for the circle~ LOVE that!!! Everything is simply stunning! Awesome job!